At the age of 21, Abdul Aziz (Ibn Saud) decided he should make a decisive move to restore his family’s fortunes. With a small band of trusted companions, he set out from Kuwait and reached the outskirts of Riyadh in January, 1902. The difficulties of taking Riyadh with so small a force were obvious and intimidating. Ibn Saud asked for volunteers to accompany him in the execution of a plan which seemed to have only its boldness to recommend it. Under the darkness of night, together with his cousin Abdullah bin Jelawi and several other volunteers, Ibn Saud stealthily made his way to a part of the city wall which he knew they could easily scale unobserved with the help of grappling irons. The wall he chose was adjacent to the house of a man who had served Abdul Rahman, Ibn Saud’s father, some years before when the Al Saud had still ruled in Riyadh. When the wife of this man realized that the son of Abdul Rahman had come to reclaim his birthright, she vouchsafed some useful information about Ajlan, the Amir of Riyadh, the man Ibn Saud would have to oust. Once within the walls of Riyadh, and with the benefit of this woman’s information, the small group quietly made its way to an empty house close to Ajlan’s residence. They entered the house, climbed to the roof and, by leaping from one roof to the next, reached the Amir’s residence. There they waited. At dawn, after prayers, Ajlan emerged from the Mosque into the street. With his quarry in the open, Ibn Saud gave vent to a loud battle cry and sallied forth from Ajlan’s residence to attack. 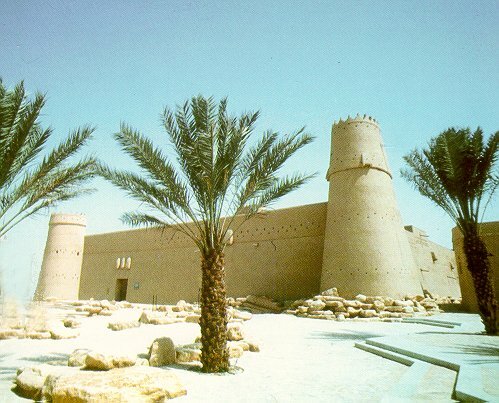 Ajlan fled back towards the Mosque, with Ibn Saud and his companions in hot pursuit. Quickly cornered, the Amir defended himself briefly until the sword of Abdullah bin Jelawi cut him down. 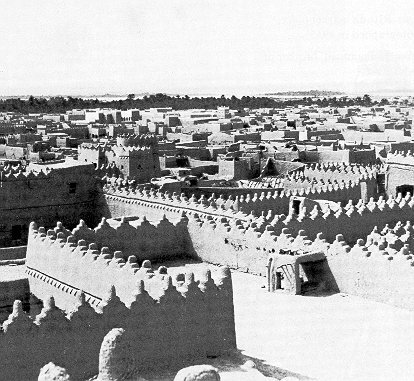 The garrison of Riyadh was utterly demoralized by the unexpected attack and by the death of their leader. Assuming that such an assault could have been mounted only by a large and well-equipped force, they surrendered without further resistance.